So I went home last night and swatched the Linen Drape like I promised. It was fun! I tried three different openwork patterns, and I’m still not sure which way I’d like to go. They all have good points and bad points. 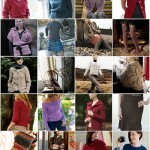 And honestly, I’d like the top with any of the three swatches that I knit up. So, I’d like to hear your opinions. The top I’m making is inspired by the tank on the right. It’s from VK Summer 04. It’s hard to tell, but the top portion is stockingnette with occasional purls sticking out to give it just a bit of texture. 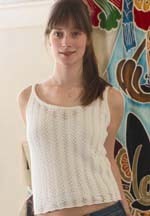 The bottom part (from below the bust) is made up of a meshy knit pattern. It’s one of the three I swatched. The top one is the stockinette swatch with bits of purl stitches. I know it’s hard to see it, but it’s there. This is my gauge swatch. 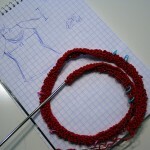 The second swatch (we’ll call it option 1) is the original meshy openwork that Vogue Knitting used. It’s very pretty and makes up almost diamond-like holes. It is also the most open of the three. In terms of knitting it, it’s also the hardests of the three. It has quite a few k2tog’s which slow you down – particularly with Linen Drape. The wrong side row on this one is actually easier and quicker than the right side row. The third swatch (we’ll call it option 2) is a chevron pattern that I borrowed from a Rosie’s pattern that they were giving away this weekend. I like the edge this one makes and if I use it I may even do a picot edge below it. 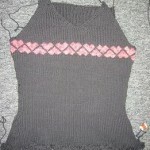 The lefthand portion of it has 3 knit stitches. I would reduce this to 2 for the lace up part. Three just seems too thick and heavy for the design. It’s the fastest to knit of the three swatches. I modified the center decrease to be a centered double decrease (learned this when doing that Domino top in March). It’s easy and fast: slip 2 as if to k2tog, k1, psso (both, as once). The other cool thing about this pattern is it’s a 2 row repeat, with wrong side rows being straight purls. I didn’t do this stitch pattern justice though. I should have cast on for three repeats as you need at least that many to get the full effect of the swooshes. It’s a 4 row repeat, pretty straightforward. It also makes a slightly wavy bottom edge. I am leaning toward one of the three right now, but I’m not going to tell you which. I’d love to hear your thoughts – including why you think I should go with a particular one. Note: I did wash and dry all the swatches before their photo shoot. In particular, this helped swatch #2 considerably – evening out the knits between the yo’s. I like #3 the best! Enough open and enough closed to make you able to wear it comfortably — only the suggestion of skin showin’ and still cute as heck! I like #1 the best. I like the straight edge, instead of the wavy ones. I like option 2. I like the structure. I’m into precise this week. I’m actually picturing that part knitted in the round with no lace up. Then lace up on the bust. I like #2 the best. Very cute. Look forward to seeing it! I’d go for option 3, but then, I’m working on the Victoria tank myself! 😀 …ooooh, pretty…. At first glance, I like option 1 the best. I love the openwork and stitch pattern. I also agree that for that particular tank, I like the straight edge of that swatch. All of them are great though. And I love the color. I like option 2. It’s pretty. Option 1 is nice, but I don’t think would look as nice with a lace up front. I like the comment above about knitting that part in the round and lacing up just the top. I really like Option #1. But, if even swatching it seems the hardest and most time consuming… I also like #3 if you want a little less openness. It’s hard to tell with the two repeats of the swatch, but in the pattern picture shown, the striping effect from a distance is very nice. Option 2. I just really like the chevron look. It leaves a cool edge at the bottom, is airy enough for a summer top and it’s fast! 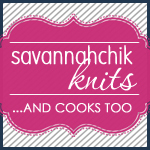 All about instant knitting gratification! I am torn between 2 and 3. I think I prefer 2. #2, but I can’t really give a good reason why, except that when I first saw the swatches, I could really picture that swatch knit up in the top. I just like it best, that is why!